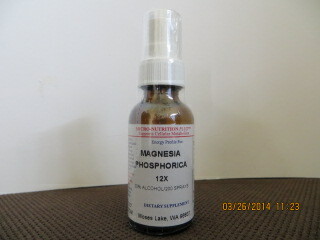 Magnesium Phos is homeopathic Magnesium phosphate. Lactose free formula. Liquid dilution for quick absorption. Beneficial for those who are lactose intolerant or have a dairy allergy. Magnesium Phos is the best remedy for muscle spasms-back, leg, abdomen or calf. Use Magnesium Phos in the evening for a peaceful night sleep without muscle cramps or charley horses. Relax tight back muscles. Supports intestinal health and beneficial for abdominal spasms and intestinal problems such as colitis or constipation. Magnesium Phos calms agitated nerves for pain relief of headache, writer’s cramp, sciatica, neuralgia. Use before and after dental work to calm tooth pain. Spasmodic is a key symptom and Magnesium Phos calms spasmodic coughs, hiccups, menstrual cramps. Magnesium helps with abdominal pains improved by eating. Magnesium Phos, especially in low potency 12X, can help your body utilize magnesium in the body and from food and is completely safe (unlike 500 mg supplements that can cause bowel overload with resulting diarrhea). Cell Salts can improve the body’s ability to absorb Magnesium. If lacking in Magnesium Phos, nerves are on edge with the inability to relax emotionally (showing as anxiety, nervous disorders, depression) and physically (showing as muscle problems, fibromyalgia-worse with even a light touch, nerve sensitivity-even the skin may feel overly sensitive). Cell Salts means minerals for cell health. Biochemistry developed by Dr. Schussler is use of minerals in homeopathic potency. Cell Salts are used successfully because minerals are the foundational nutrition for the body's enzyme activities and energy cycles and Cell Salts are instantly bioavailable. Homeopathic liquid dilution, 1 fluid ounce, in a base of food grade non GMO alcohol (corn). You can use liquid cell salts for general health and maintenance or for treatment of symptoms. Cell Salts are used successfully because they are the foundational nutrition for the body’s enzyme activities and energy cycles. Cell Salts are instantly bioavailable. Suggested dose is 3 sprays at one time and repeated 3 times a day for treatment of symptoms. Use less frequently as symptoms improve.